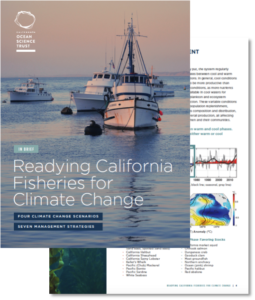 California fisheries are at risk from a variety of impacts including a changing climate. The Ocean Protection Council (OPC) provided funding to Ocean Science Trust to convene an interdisciplinary OPC Science Advisory Team (OPC-SAT) working group to provide guidance to the state on the potential impacts of climate change on fisheries as well as deliver science-based approaches to manage these impacts. This project was developed for consideration by the California Department of Fish and Wildlife (CDFW) to help inform the state’s process to amend the Marine Life Management Act (MLMA) Master Plan. Products from this project have been submitted to CDFW for review and may be integrated, in full or in part, into a draft Master Plan Amendment. Additional information about the Master Plan amendment process, including key resources and opportunities for stakeholder engagement, is available at https://www.wildlife.ca.gov/Conservation/Marine/Master-Plan. 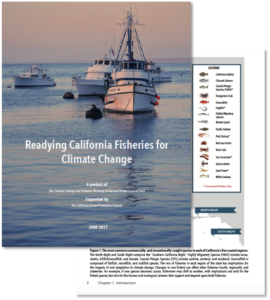 Scientific Guidance Document: Readying California Fisheries for Climate Change. Staff from the Fish and Game Commission will be hosting fishing community meetings this summer and fall focused broadly on increasing the resilience of coastal communities. The next meeting will be on June 21st in Smith River, CA (more information here).